Rondeau Provincial Park is located in Morpeth, Ontario along the shoreline of Lake Erie. It is the second oldest provincial park in Ontario established on September 8, 1894. 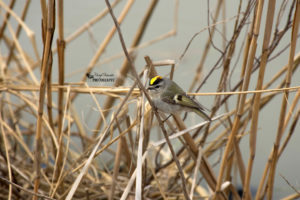 Rondeau Provincial Park is a world renowned bird watching destination in the springtime boasting 334 species of birds recorded within the park. 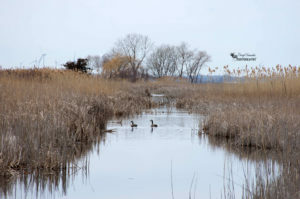 There are also 11 kilometres of sandy beaches for enjoyment along the lakeshore and there are 22 kilometres of hiking trails throughout the carolinian forest, meadows and marshlands. 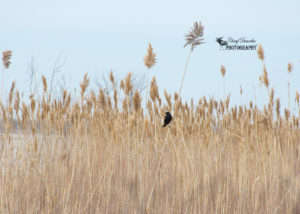 On the weekend I decided to take a drive down to Rondeau Provincial Park for the first time. 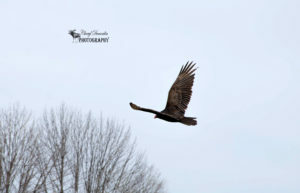 Before entering the park I encountered a turkey vulture soaring over Rondeau Bay. 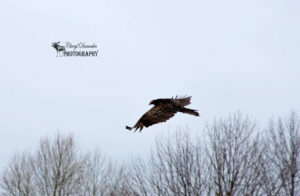 I pulled my vehicle over to the side of the road and was able to take a few photos before it disappeared from my view. 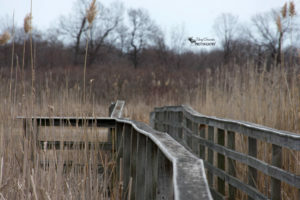 After entering the park I chose to hike the Marsh Trail located through the extensive marsh area. 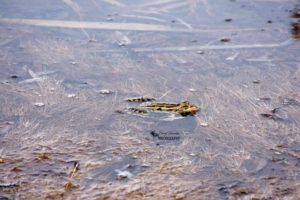 As I made my way down the trail I was greeted with the sounds of singing frogs. 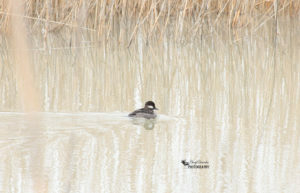 They were located in the little ponds on either side of the pathway. After I took a few pictures of them I took a moment and just listened to the beautiful chorus of sound that they were producing before moving on. 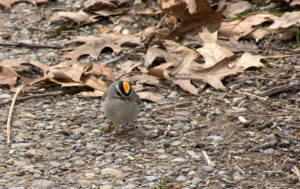 It wasn’t too long after I left the frogs before I saw my first bird. 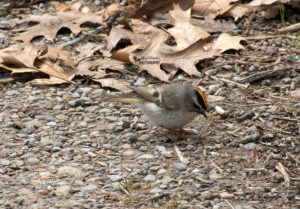 It had bright yellow and and orange feathers on the top of its head which I discovered afterwards is called a Golden-crowned Kinglet. 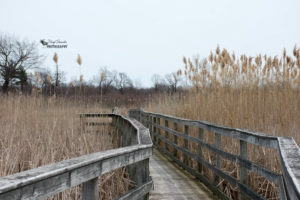 When I reached about the halfway point in the trail I came upon a boardwalk which led me towards Rondeau Bay passing through the marsh grass. Unfortunately due to some damage to a portion of the boardwalk I was forced to turn around and head back to the main trail. 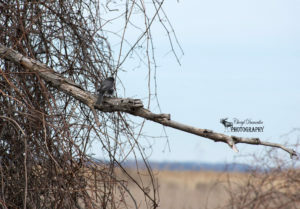 As I continued on my way along the trail the large trees on either side were replaced with the marsh grass and inlets of water leading out towards the bay and other bodies of water. 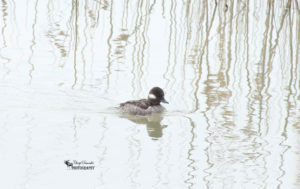 It was at this point on my hike that I began seeing many species of duck including a female Bufflehead, Common Merganser and Horned Grebe. I also saw Canada Geese swimming in the inlets looking out towards the bay with the wind turbines off in the distance which created a beautiful picture. Finally I arrived at the end of the trail and took in the view of Lake Erie before turning around and making my way back to the starting point. After I made it back to my vehicle I checked my All Trails app on my phone and realized that I had hiked 14.4 kilometres which is my longest hike to date. It took me approximately 3 hours and 45 minutes to complete it and I am looking forward to hiking even longer distances in the future. 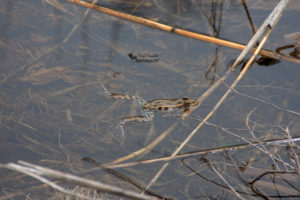 Below are the photos I took during my hike at Rondeau Provincial Park on the Marsh Trail. 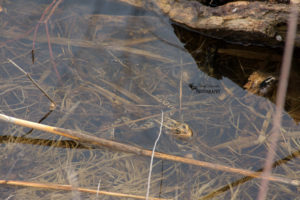 This entry was posted in Hiking Trails, Nature Photography, Provincial Park, Wildlife Photography and tagged birds, Camera, frog, hike, hiking, marsh, nature, nature photography, Nikon, Nikon D7200, ontario, outdoors, outside, Photo, Photography, Provincial Park, Rondeau, Rondeau Provincial Park, trail, trails, wildlife, wildlife photography.